I kid you not. 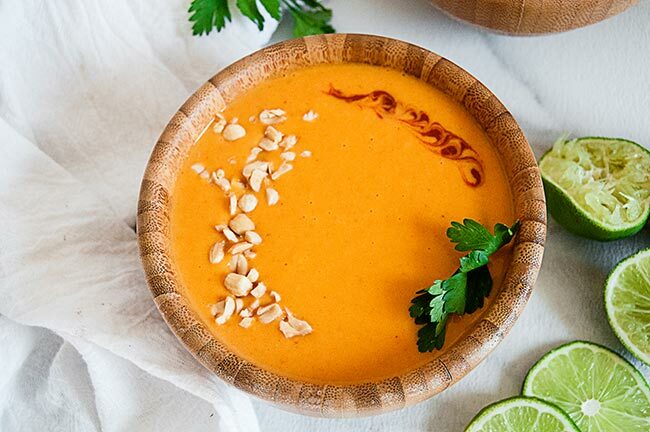 This Thai sweet potato soup is as easy as making a smoothie. Literally. There’s no chopping, no sauteing. Heck, I don’t even use my oven to make it. And sometimes, when I am feeling super lazy or am really crunched for time, I do the whole shebang in my microwave. Yep. The whole thing. Meaning no pot on the stove, no stirring. Nothing. Just zap, blend, pour into a bowl and zap again. Then say hello to your new favorite quickest ever soup. I’ll be honest. This soup was born out of laziness, boredom, and a desire to eat something other than salad for lunch on one of the recent brutally cold days we’ve had here in the northeast lately. I really didn’t want to schlep myself and the Goose to the store, so I had to make due with what we had on hand. And we almost always have sweet potatoes because they are healthy and versatile. Plus my fridge is almost always full of ingredients to do a quick curry because my Thai Chickpea Curry is one of my go to quick meals. Because easy. So I thought, why not do a quick soup and see how it worked out? And guess what? It was awesome. So good in fact that this has worked its way into our recent dinner rotation. Because it’s healthy, warming, and hearty all at the same time. It doesn’t hurt that it has a ton of zip from the Siracha and the curry, which btws, you can adjust to your liking. 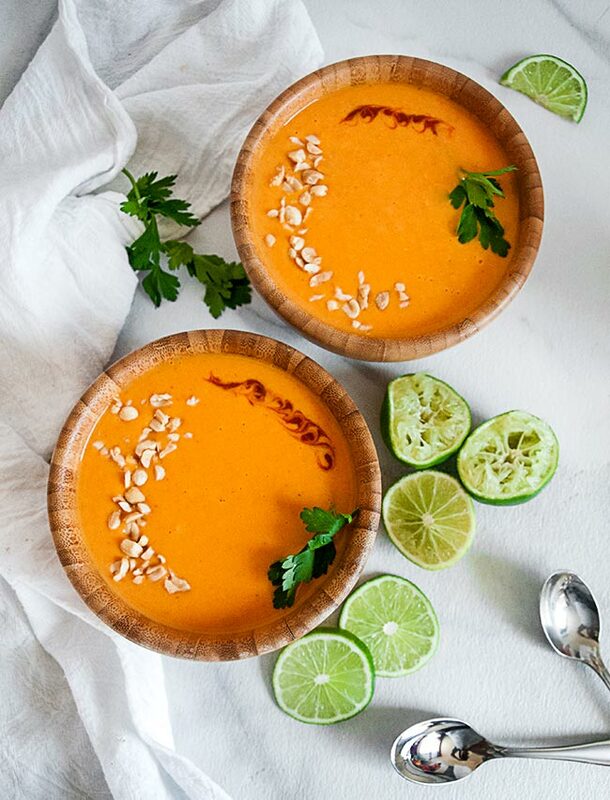 And the bright freshness from the lime makes this easy Thai Sweet Potato Soup feel like a welcome change after all the heavy meals we had during fall and the holiday season. Tbh, it’s a winner because it’s so lazy. Sometimes, I just can’t even (yes, basic moment in full force there) with fussing but still want something that appeals to my inner food lover. And this Thai sweet potato soup is it. What’s your go to fuss free meal? 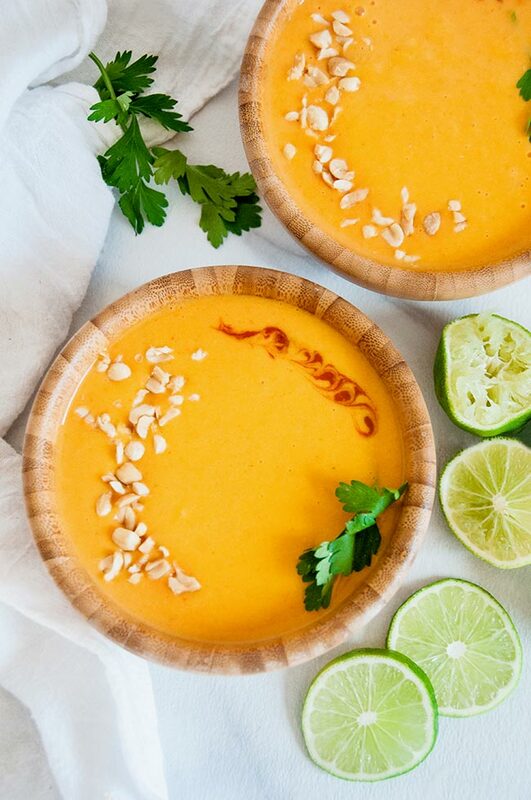 Easy Thai Sweet Potato Soup makes a healthy vegetarian (or vegan) meal that can be made using only the microwave and a blender. Poke a few holes in the sides of the sweet potatoes with a fork. Wrap them individually with plastic wrap. Cook for about 9 minutes in the microwave. *** Let cool. Scoop the insides of the potatoes into a blender and discard the skins. Add the coconut milk, soy, lime juice, honey or sugar, Siracha, and red curry paste. Blend until smooth. Pour into a bowl and microwave to desired temperature. Garnish with chopped peanuts, cilantro, and more Siracha if desired. Enjoy! Poke holes in the sides of the sweet potatoes with a fork. Wrap them in aluminum foil and bake for about 45 minutes or until tender in a 400 degree oven. Let cool and scoop the insides into a blender, discarding the skins. Add the coconut milk, soy, lime juice, honey or sugar, Siracha, and curry paste to the blender. Blend until smooth. Pour into a pot and heat over medium low heat until desired temperature. Dish into bowls and serve with chopped peanuts, cilantro, and Siracha as garnish. Enjoy. **use more or less depending on your desired spice level. 2 tbs of each makes for medium spicy. I like mine spicier so normally add an extra spoonful of each. ***Most microwaves have a potato setting that lets you customize the setting based on number of potatoes. Select the option for 2 if given the choice. You may need to microwave a little longer, depending on the size of the sweet potatoes. The potatoes are done when they are tender. Always looking for good meals for my strange diet and I am a soup fan! Beautiful presentation… I think I’ll go and try this now! 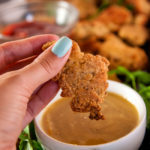 Thanks for the new recipe! What kind of diet Kay? 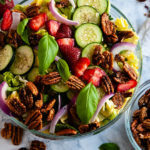 This recipe looks amazing and I LOVE sweet potato! I can’t believe how easy this soup is to make with such few ingredients! This is definitely happening for lunch tomorrow. 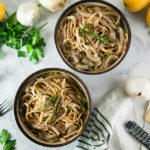 What an easy recipe and so full of flavor too! I can’t believe it comes together so quickly, can’t wait to make it soon. YUM! 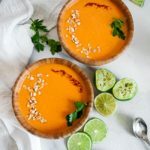 I am a HUGE fan of butternut squash soup in the Winter time, but haven’t tried sweet potato soup! I think this might be right up my alley! 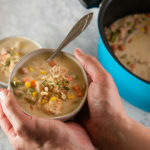 Love this comforting, soul warming soup! I love sweet potatoes and I never thought to make them into a soup before? This sounds so delicious!